Cat Aggression – Where, Why and When? Don’t panic, stay quite calm, and still and wish the lion isn’t hungry. As you can see your choices are limited but I wouldn’t want to show my aggression towards it, it will probably get more aggressive towards you, running like the wind may save you until the inevitable happens and it catches up with you, the best option is to stay calm. It’s the same on a smaller scale with our cats, after all they are related to the big cats in the jungles and wilds of afar, the more you wind a cat up the more aggressive it gets, as it can’t speak like humans and say "no", it speaks with it claws and teeth. There are many reasons why cats are aggressive; lets call it ‘feline aggression’. Understanding the reasons for the different types of ‘feline aggression’ and then trying to recognize the warning signs may help you to deal with these incidents of feline aggression. It’s probably best to get a picture of ‘feline aggression’ in your head. Imagine some scary movie – a snarling cat with sharp teeth showing through a wide-open mouth, its ears flattened back wards and its wide-open eyes showing a pair of dilated pupils. Accompany that with a melee of growls and hisses and it isn’t very pleasant. Understanding the different types of ‘feline aggression’ and the reasons for them may help you deal with your cats aggression. 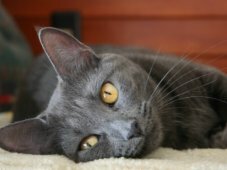 I’m not painting a nasty picture of Cats, but like us, they are prone to random bouts of aggression in various forms, it may seem an attack on yourself comes right out of the blue, but more often than not there are several warning signs, and identifying these warning signs could prevent some pretty painful bites and scratches. If your cat has wide-open eyes then it is probably in an aggressive mood, if its pupils are dilated, it fears some kind of attack on him, however, its pupils do become very constricted when the cat tries to threaten back. Other signs are if the cat has flattened ears or its tail is lashing erratically, and to even complicate things – a straight tail with bristle fur is also a sign of aggression. As you can see there are lots of things to be on the lookout for, it is not an easy thing to spot. If your cat is making hissing noises and sometimes spitting it is best not to agitate him as his meows could soon turn into growling and snarling. To understand feline aggression fully, I think you need to be educated in ‘Cat Behaviorism’, something that I am not. According to Behaviorists there are five main types of feline aggression. When a cat is frightened, its response is two fold – ‘fight or flight’. Most cats prefer the ‘flight’ option and choose to run away from real or imaginary danger, but if they feel cornered or trapped they may attack. Even the most timid cats will strike if there appears to be no way of escape. This type of aggression is probably the easiest for us to identify, however, timid cats may be afraid of all sorts of imaginary threats, like sudden movement or loud noises. It is also feasible that your cat may have a traumatic past that makes it afraid of certain things, things that you may not be aware of This aggression is also the most common reaction to physical punishment. Cats do not learn from any kinds of punishment, physical or psychological, like the ones we use with dogs or children. Instead of changing their misbehavior because of its punishment, they are more likely to react violently because they are afraid of you. Sometimes cats cannot retaliate against the source of aggravation and they may redirect their response to the nearest person, cat, or other animal, which may be your dog. Your cat could be sitting in the window watching the world go by when it suddenly notices a dog, a cat, or something it’s not seen before. It starts to get agitated but being indoors it cannot do much to deter the possible threat. You pass by and you casually stroke your cats head, the cat is more than likely to hiss and lash out at you with all that pent up aggression which to you may seem like an unprovoked attack. This is probably the easiest type for us to identify with, your cat is in a lot of pain, and so lashing out while she is in this confused state seems natural to her. For this we usually sympathize with our cat when she lashes out at the vet, for example during a painful procedure. Remember the cat doesn’t understand that this is for her own good and her natural reaction is to defend herself from pain. Even picking up your cat to stroke or groom her could cause pain as they have very sensitive skin and they may react to pain that we do not know that we have caused. I used to have a cat that only liked being picked up a certain way; I had the scratches to prove it. We can’t win can we? Your cat is laying by your side, begging for some petting and you start to gently stroke your cat, the purring starts, you both feel relaxed. A few minutes later the purring slowly stops, the tail starts to twitch and suddenly the cat tries to grab your hand with its teeth and claws. This is a well-known behavior pattern, but it is hard to explain why some cats are more sensitive than others to petting. Behaviorists reckon that it may be down to early socialization with people or something in their genetic make up. I can understand that, I feel more comfortable with people I have known a long time. Some cats have a tendency to become over stimulated and may feel threatened when petted for too long. Exactly how long depends on the cat, if you have a sensitive cat, you will usually learn what is considered to be too long. Your cat may start to become aggressive because there may be something medically wrong with him. In my research I have discovered that tumors, blocked blood vessels and even rabies have all been associated with aggressive behavior. It would be advisable, as a precaution, to consult your vet if there is a sudden onset of unprovoked violence. You should know your cat best and any changes in behavior should be noted and passed onto the vet during regular health check ups. I must point out that a cat scratching you is not always about aggression. A cat can scratch you when it is playing or even ‘complimenting’ you by a cat ‘love bite’. It may hurt just the same but this is different from aggressive behavior. It doesn’t make it easy for us, does it? Now that we are in a position to identify cat aggression, the next thing is to decide what to do if your cat has attacked you. It may be holding you quite firmly with its claws and teeth, I would recommend resisting the urge to struggle free, this will probably result in more scratches and bites. Try to keep calm, don’t hit the cat (remember pain induced aggression), don’t shout at the cat (remember fear induced aggression) and with your other hand gently try stroking the top of its paws, speaking gently and calming it down. Now you are free, don’t quickly pull away and don’t move away from the cat, but do stop stroking it. Let the cat sit where it is and let it ‘cool off’, when it appears calm try to move away from it and go and soothe your wounds. I think that this is a learning curve between you and your cat, most of all be patient and understanding towards your cat. ← Indoor or Outdoor Cats? Are Mischievous Cats Just Bored? Jun 29, 2017 admin Comments Off on Are Mischievous Cats Just Bored?